This is a script for quick deleting comments left in the upper left corner of the chart. Other objects are not deleted. The script reports about finishing its operation using alerts. an indicator or EA that doesn't have a function of deleting its own comments (an application under development or downloaded from the Internet). It will be more convenient to use SD Delete Comment for MT5 if you set a hotkey for it or add it to Favorites in the Navigator. click "Add to favorites" and/or "Set a hotkey" in the menu. Fixed spelling of word "Server" in the script messages about telling the server time of comment deletion. Now the alert signal contains not only the text of the comment deleted by the script, but also the server time. It's been added for convenience - when you need to view the text of a comment previously deleted by the script in the list of past alert signals or the Experts terminal tab. 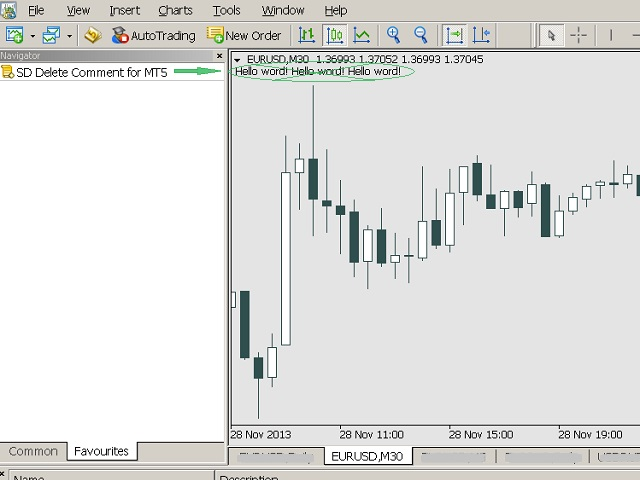 In addition, added display of MQL5 program runtime error code if the script cannot perform its functions. - Now, once it ends working, it shows an alert containing the text that has been deleted. - If there are no comments on the chart set using "Comment();" or "ChartSetString(chart_ID,CHART_COMMENT,str_value);" functions, the script will display "There is no comment there. Script removed. ".